As an NHS Foundation Trust we have a Council of Governors made up of elected public and staff governors and partner governors who represent local organisations who we work with. The Council of Governors helps hold the trust to account to local people. They are involved in formulating strategy, monitoring performance and engaging with the public. 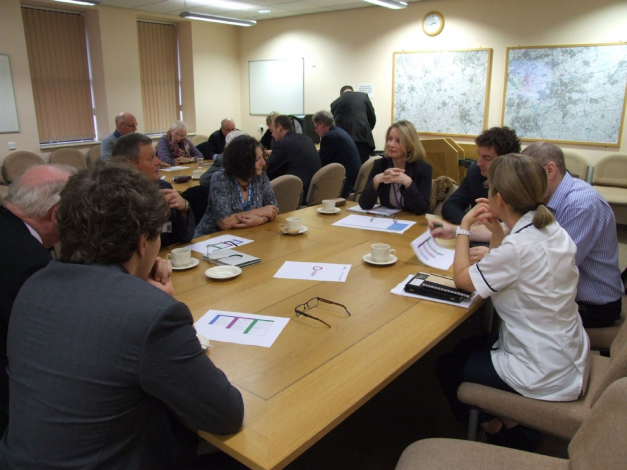 The Council of Governors helps shape and endorse the future strategy of the Trust and provides a critical link between the Hospital Trust and the people it serves within Warrington, Halton and other local areas - ensuring that local people input into decisions and plans for the hospitals. 6 Partner Governors - nominated by organisations we work closely with in Warrington and Halton. The Council of Governors meets formally six times a year in public and anyone can attend to listen to the meeting. The meeting is Chaired by the Trust Chairman. At the meeting, the Governors receive the latest performance information and have the chance to analyse it and raise questions. The formal Public Council of Governors meeting programme is a small part of the Governors’ work in the Trust. Governors have a number of Committees which they Chair and sit on which allows them to bring information and views to the main Council meeting. These Committees focus on a number of areas including quality in care, finance and communications and membership. Other agenda items include updates from those Committees. Governors also help us to formulate our annual strategic plan. They hold workshops and survey their members to ensure the plan is in line with public expectation. They also carry our unannounced ward inspection across the Hospital where they monitor standards of our care and talk to patients and staff. If you want to contact your Governor please email WHH.foundation@nhs.net with your query or with a request for them to contact you and tell us the area you live in. You can also call us on 01925 66 2139. Our Governors are happy to come and present, meet or liaise with any community organisation. Please contact us to arrange a meeting. There are 16 Public Governors representing Halton, Warrington and the areas to the north and south. Each governor is from - and is elected by - the Membership who lives in their Constituency. You can view more detailed profiles of our Public Governors at the bottom of this page. There are five Staff Governors, elected by hospital staff and representing the five main staff groups at the hospitals. Working alongside our elected Public and Staff Governors will be five Stakeholder Governors. These governors are nominated by organisations or sectors that we work closely with. They include the local Borough Councils, local commercial and voluntary sectors. These biographies give you some further detail on your Public Governors at Warrington and Halton Hospitals NHS Foundation Trust. I am passionate about delivery of NHS services, can see where improvements are needed. By embracing change, improvements are possible. Having been re-elected for a second term I am now looking forward to representing my community and continuing to improve patient experience. • Facilitated two Myeloma UK Awareness Days at Warrington. Delivering early diagnosis information for Doctors and patients. with Dementia, their families and carers to enjoy the outside space in Spring/ Summer 2017.
and their vision for Healthcare in the future. • Participate in monthly Ward visits raising awareness of the ‘Patient Experience’ to Trust Management. • Represent Governors at Charitable Funds Committee. • Attend many Governor and Trust meetings. Recognising restraints upon resources it is important to engage, challenge and seek reassurance for decisions made to deliver High Quality, Safe Healthcare our Patients and Staff deserve. Being a Governor is most rewarding. I am passionate about our NHS but appreciate at time there are failings I'd love to help improve our system. I have been in Nursing since leaving college age 18. I have worked in the NHS as a Nurse and as an Occupational Health Adviser to seven hospitals and Cheshire Ambulance service. I have been running my own Consultancy for the past 20 years, advising both the NHS and many industries on the effects of health on work and work on health, ensuring that employees remain in work healthy. Colin is a Trustee of Halton Haven Hospice. He is a former Governor of Wade Deacon High School and was also a school appeals panel member in Halton. Colin is a Fellow of the Chartered Management Institute and a member of Association for Project Management. He has experience in managerial, financial and commercial knowledge. I have a passion for the NHS and in these testing times want to ensure that the needs of the local population are being represented. At the end of the day, I am afamily man, and believe every person and family has the right to quality patient care. In my family, my son has multiple food allergies for example, and I want to ensure the Trust is the best it can be for my family and yours. I have a broad work experience across the health, public, and private sectors and also as a lay member in the NHS. In my career I have managed complex projects, constantly undertaking business and data analysis, and also scrutinising the governance of organisations. Crucially I would look to use my 5 years’ experience as public governor for Cheshire at the Ambulance Service, where I was Chair of the Quality & Patient Experience group. Here I acquired the skill of balancing the duty to hold the Board to account with representing the local population, and of supporting and adding value to the Trust. NHS Trusts are complex organisations and they say it takes some months if not years to become fully effective. I would like to fast track that time and start adding value from day one. I care deeply about the NHS. Over the last 18 months, I have been caring for my elderly parents, one of whom is a palliative patient, the other with a chronic heart condition – so I have frequented Warrington Hospital on many, many occasions and have seen, first hand, the great work that goes on. I want to support the work of the hospital and be a critical friend, to help to ensure that the services the hospital provides continue to improve for patients but also for their family members who care for them, and not forgetting the fabulous staff who work so diligently. I genuinely want to give something back to society. I am a qualified primary school teacher and now work in local government as an education advisor so I have a good knowledge of how the public sector works. I have been a governor of a local school, as well as a governor in three other schools in the Merseyside region. I care about people - people who access public services and people who work in the public sector. Keith is a retired mechanical engineer and has been a former Cheshire County Councillor for 13 years where he served, amongst many other committees, Chairman of Social Services so he knows the problems that are encountered between Councils and the NHS. He was made an Honorary Alderman in 1974. Keith also served on Warrington Borough Council for 14 years and during that time was Deputy Leader of the Council from 2006 -2011. He was also made an Honorary Alderman in 2012. Keith been and still is a local Parish Councillor for over 39 years and is actively involved in the villages of Culcheth, Glazebury & Croft, being a governor of Culcheth Primary School, Chairman of the Culcheth Centre, Chairman of Culcheth Education Foundation Trust and a member of the Friends of the Culcheth Library, as well as being a Public Governor for the NHS Warrington & Halton Hospitals Foundation Trust. In my spare time my wife and I run a Luncheon Club for the over 60’s every Tuesday. In 2011 I received my MBE for services to the Community in Cheshire & Warrington. I am passionate about patient care and want to help shape the future of the Trust to deliver improvements. As a green belt lean six-sigma trained business analyst with a background in change management, I am a strong communicator who is able to identify opportunities for change and challenge the status-quo. I am an excellent listener who is able to appropriately question in order to reach the underlying root cause of problems; once understood, I am able to work as part of a team and recommend prioritised alternative ideas as potential improvements. I have had many personal dealings with the Hospital over the years, with varying degrees of patient care, as many of us have. I recognise that there are always improvements to be made, and I'd love to be a part of that change. I am an ordinary human being who really wants to make a diﬀerence. I am passionate about the NHS, and about supporting my local community, and would be honoured to be selected as their representative voice to help make improvements to the Trust to enhance patient care and experience for everyone. To help the NHS look after the needs of the people it is there to look after. It's vital in this time of austerity, that people who work in the NHS and the patients they care for, don't get relegated in the drive for efficiency savings and privatisation. Only through negotiation and cooperation, can our NHS hope to survive under the current direct attacks until a government that recognises the value of what the NHS stands for, gets elected. The pursuit of profit was not in the original idea for a free service that treated all who needed it, free. The health and welfare of the people of Warrington and the wider UK are not there to be used by the few in the pursuit of profit, playing God with their lives and treatment. We have seen the future. It's alive and living in the USA, where the poor and those who are vulnerable can't afford treatment or only qualify for basic care, at the whim of their insurers. Even they have recognised the value of the NHS and have tried to implement changes for the good of all. We still have the best health care system in the world and we need to fight to keep it that way. For many years I have been involved in trade unions and was a local councillor for a time. Anne has worked in the Civil Service for 38 years, her final position was leading an Asset Auditing Team, questioning systems and procedures as well as care and/use of facilities and services. Anne was also responsible for the Quality Management systems and Training Services. She is married with 2 children and 3 grandchildren. She cared for her mother for over 12 years, consequently Anne’s special interest is in carers, whether it be for children, the elderly or Veterans; her working life having brought her into contact with all parts of the Armed Forces. I have been involved as a Public Governor for 3 years, in which time I have gained considerable knowledge and experience of the workings of our local NHS hospitals. I'm passionate about our local hospital and ensuring our community receives the best care and value for money services possible. I thank you for your support in re-electing me for a further term. I bring experience of both the private and public-sectors having worked in facilities management for some 30 years. I use my skills and experience gained in technical back of house and hotel front of house service delivery along with a wealth of management skills for the good of the community to help shape the services delivered by the Trust. I was elected Lead Governor in February 2017. As Lead Governor, I work to improve the involvement and impact the Council of Governors have and to these ends have worked with the Group to improve the communication between NEDS, the Board and the Council of Governors. I ensure the Council are aware of the National picture through membership of the National Lead Governors Forum. I chair the Governor Quality in Care Group; the Group organise Governor Observation visits (unannounced) on the wards and departments and through this have been able to work with the Trust to improve any patient safety / experience issues observed. Now retired I can dedicate the time necessary to be fully active and involved in the roles of Public Governor and Lead Governor for the Trust. I actively participate in Quality in Care, Engagement and Patient Experience Committees as well as participating in the PLACE assessments (Patient Led Assessment of the Clinical Environment) over the past 5 years covering both Warrington and Halton sites. I am especially interested in the facilities and standards of delivery of the wide range of services required from the trust and the achievement of the very best value for money services. I focus on the Standards of Patient Care being delivered across the Trust. I see a major part of the role as being available to all members of the Council of Governors and the community in the constituency, to listen and act as a conduit to put forward views to the trust to ensure continued a high standard of care and the full range of services the citizens of Warrington need now, and for the foreseeable future.